Metro Division 9 team wearing the pink polo shirts. 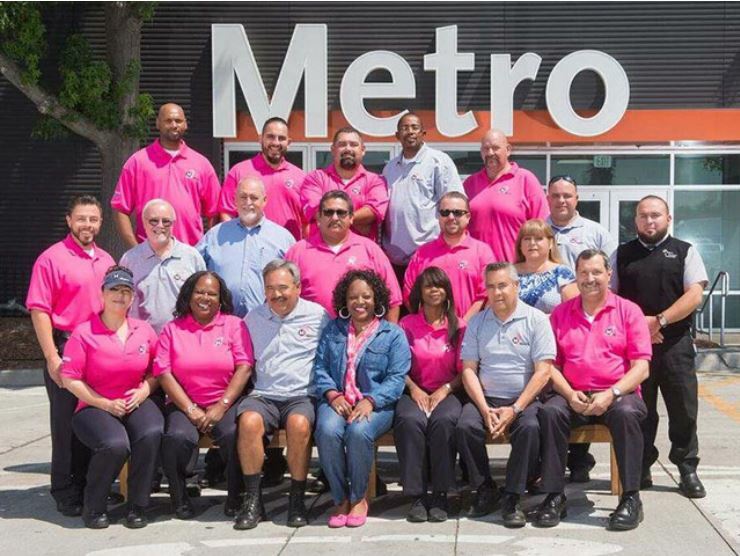 Metro riders may notice Metro bus and train operators wearing pink and gray polo shirts instead of their traditional work uniform shirts through the month of October. Operators will wear the shirts as part of a campaign and partnership with the American Cancer Society to spread awareness on the fight against breast cancer and to support breast cancer research. The pink and gray shirt initiative was organized to highlight the importance of prevention programs and the advantages of early detection. A portion of the funds raised for the campaign will support funding for cancer treatments and free educational services. To learn more about reducing the risk of breast cancer and how you can make a difference in the lives of those who have been diagnosed, click here.